This page describes how to view and manage the entities, indexes, and statistics for the data your application stores in your database. It also shows how to enable or disable Cloud Datastore Admin access, and how to enable or disable Cloud Datastore writes. 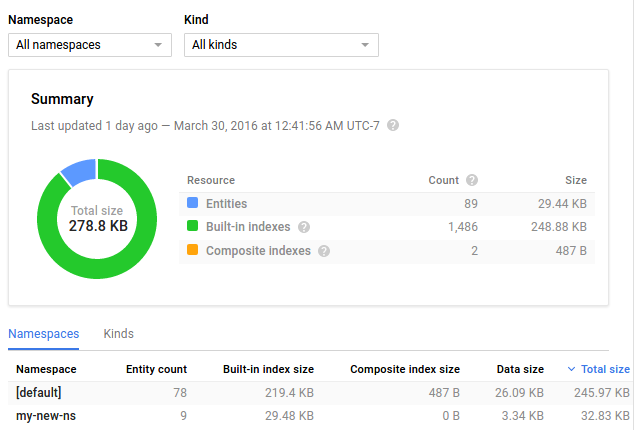 You can do these activities on the Cloud Datastore page in the Google Cloud Platform Console. 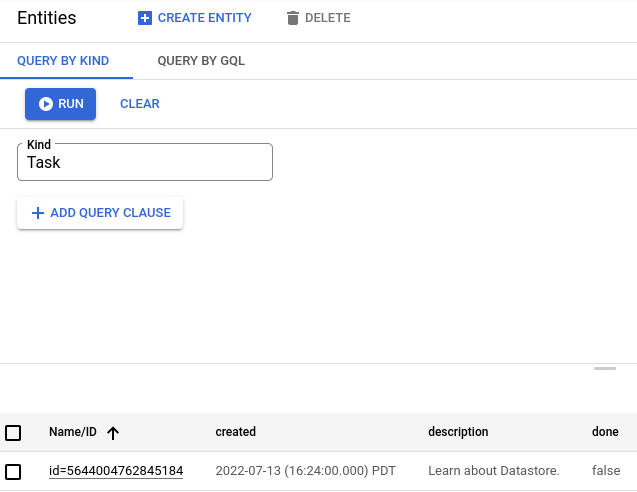 Go to the Cloud Datastore Dashboard to view data for the entities in your application, as well as statistics for the built-in and composite indexes. For more information about the statistics on this page, see Viewing Statistics in the Console. Go to the Indexes page to view a table of your application's indexes. For each index, you should see its status, such as whether it is ready to serve your application. You should also see the amount of storage space used by the index and the number of entries in each index. Go to the Entities page to view the entities that your application stored in your database. You can also create, update, delete, and query entities on this page. Learn how in the Quickstart. Note: Even after you delete all of the entities within a given namespace, the namespace may continue to be visible in the console for several days to a week. If you want to use bulk copy, bulk delete, backups, or restores, you need Cloud Datastore Admin access. Click Enable Datastore Admin to enable access, or Disable Datastore Admin to disable access. The button text varies, depending on the state of your project. Note: Previously, you could enable Cloud Datastore Admin through an App Engine app.yaml file, but this setting is now deprecated and will be removed from an upcoming SDK release. For copy, delete, and backups, recent updates might not be considered. All Cloud Datastore Admin operations occur within your application, and thus count against your quota. You are strongly recommended to disable writes during a backup or restore. Existing entities with the same keys will be overwritten during a copy/restore operation. Duplicates are not created if copy/restore operations are performed multiple times. Copy/restore operations do not delete extra data. Warning: We no longer recommend using Cloud Datastore Admin for bulk deletes. Instead, we recommend using Cloud Dataflow to delete entities in bulk. Go to the Admin page to delete all entities of a kind, or all entities of all kinds, in all namespaces. If you haven't already done so, enable Cloud Datastore access for your project. Select one or more entity kinds. It's normally a good idea to disable writes prior to a restore. This helps avoid conflicts between the restore and any new data written to your database. You can still use the Admin page to restore data and to perform bulk deletes when writes are disabled. applications that use the Cloud Datastore API. Note: The Cloud Datastore API does not allow forcing writes when writes are disabled. However, App Engine client libraries allow forcing writes even if writes are disabled. So an application written with the App Engine client libraries could modify your database instance while writes are disabled. Click Enable writes to enable writes, or Disable writes to disable writes. The button text varies, depending on the state of your project. Warning: The Cloud Datastore Admin backup feature is deprecated and will be shut down on February 28, 2019. It is replaced by managed export and import. You should migrate to the managed export and import functionality at your earliest convenience. Use the Admin page to backup or restore your data. Learn how to perform backups and restores in Backing Up and Restoring. When you run a Cloud Datastore Admin job, you are actually running an underlying MapReduce job. MapReduce jobs cause frontend instance hours to increase on top of Storage operations and Storage usage. Get details about Statistics in the Console. Learn more about Backing Up and Restoring.